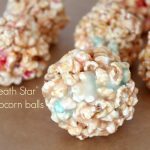 This death star popcorn balls recipe is a fun twist on your regular popcorn, thanks to colorful marshmallows. Perfect pair for a Star Wars movie night with the kids. Do you guys deal with a picky eater? I bet you hate it as much as I do! My daughter is pretty unpredictable when it comes to food, sometimes she likes certain food only to refuse to even look at it the very next day. I’m never able to make a routine and each meal is a puzzle, breakfast in particular. In the morning she’s quite grumpy and even if she loves her breakfast she’ll say she hates it. I need a distraction to make her eat breakfast and usually that is her favorite cartoons. But she loves Star Wars, just like her daddy and lucky for us, there are now Star Wars cereal boxes in a limited edition, available in major retailers and grocery stores beginning June 1st. You can get these boxes for the next few months only and then new packages and characters will be released while the cereal flavor will remain the same. Remember the days when as kids we sat down and all we needed was the box to keep us entertained during breakfast? Star Wars Cereal does just that. 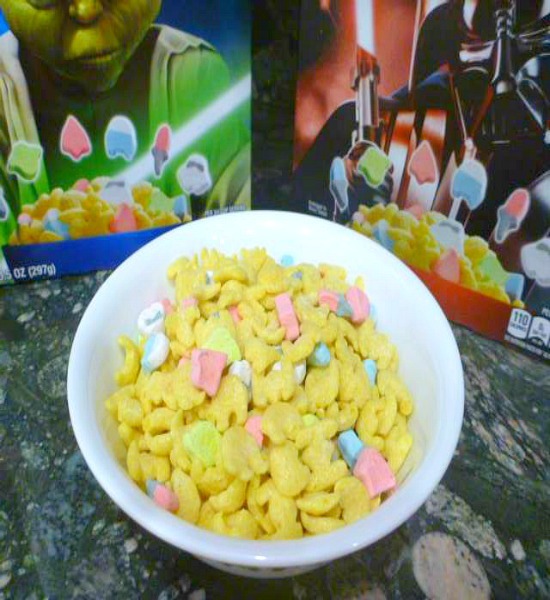 Star Wars Cereal is a delicious fruity flavored cereal with marshmallows. There is only one kind of cereal, but there are currently two limited edition package designs that you can choose from. 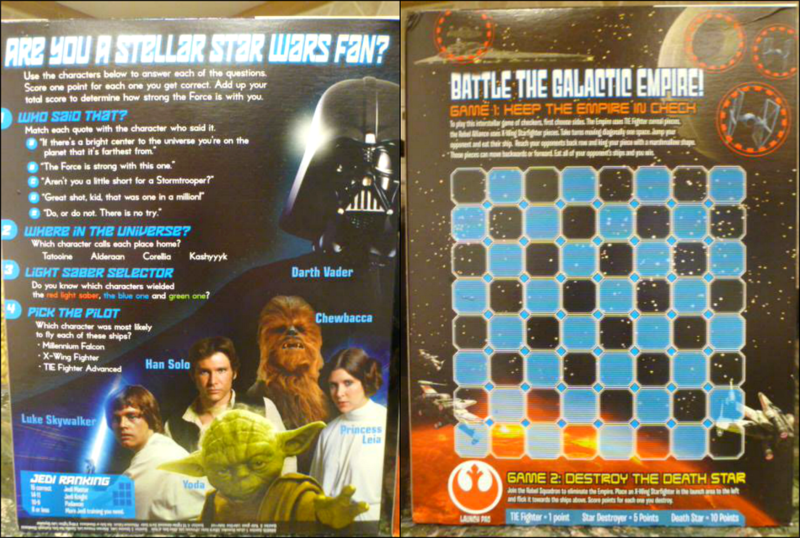 It contains whole grains, no high fructose corn syrup and is a good source of calcium and vitamin D.
The Yoda Package has a quiz on the back of the package for kids to test their Star Wars knowledge while the Darth Vader Package has a board game on the back of the package so they can play as they enjoy their delicious cereal. 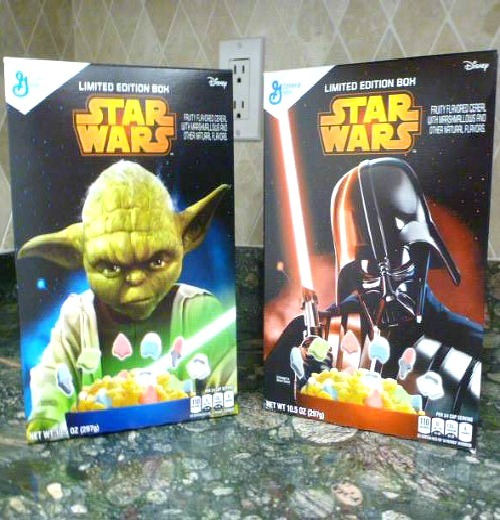 We brought The Force to our breakfast table and you can too with this $1 off coupon code. And what works best with a box of Star Wars cereal? Watching Star Wars movies! Even better, what’s the perfect match to a movie? Popcorn! Death Star popcorn balls to be more specific. Below is the recipe for the Death Star popcorn balls we’ll be enjoying and I hope you will too. Please share your story of when you were introduced to Star Wars and how you plan to introduce your kids too. Also which side of The Force are you and your kids on? 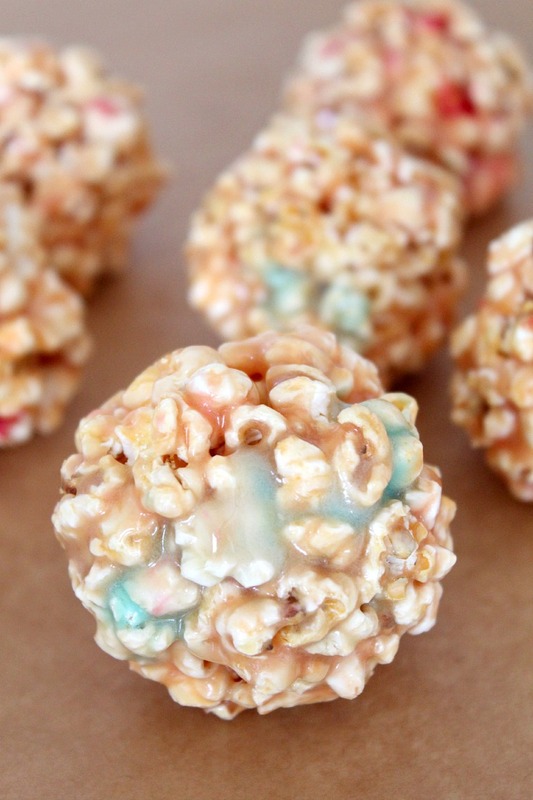 Easy peasy popcorn balls with a fun twist thanks to colorful marshmallows. Perfect pair for a Star Wars movie night with the kids. You had me at popcorn. What a fun recipe! How much fun! My nephew would love these! So easy to make – I’m going to give it a try this weekend. Thanks for sharing! Thanks for stopping by, Minh. Hope you’ll love it as much as we do. Oh my, these are fabulous! My son would love these….in fact, so would my dad 🙂 Thanks for sharing with Roses of Inspiration. Happy Wednesday! These are really cute. 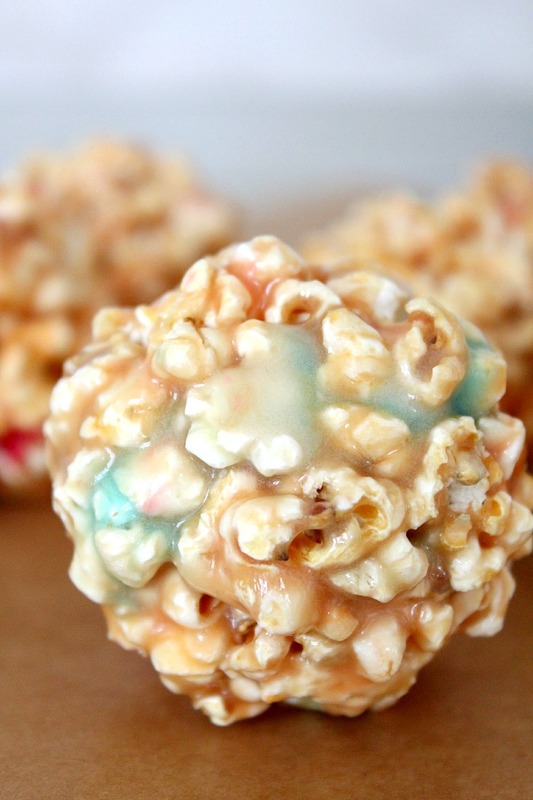 My oldest would love a popcorn ball, she loves popcorn in general! Thanks for sharing it with us! These are great, forget the kids, my fiance would love them :). I’m sharing this post on my FB page. Stopping by from End of Week Confessions. Thank you so much Ashley, you are so kind to share. Have a wonderful day! I made these without the colored marshmellows (because I didn’t have any), and they were easy and delicious! Yummy recipe! Thanks so much Lela. Hope you guys have a fabulous party! And thanks for the invite too. Have a wonderful week! The cereal looks good to me. I love having the little cruncy marshmallows in with my cereal.